"God has privileged us in Christ Jesus to live above the ordinary human plane of life. Those who want to be ordinary and live on a lower plane can do so, but as for me, I will not." These words of Smith Wigglesworth capsulize his life and ministry. This man was extraordinarily used by God to see souls saved, bodies healed, and lives changed. Your heart will be stirred as you read in Wigglesworth's own words about the dramatic healings of people whom doctors had given up as hopeless. Even in the face of death, Wigglesworth did not waver in his faith, because he trusted the Great Physician. You will discover how God can enable you to reach out to a hurting world, for, as Wigglesworth said, "Christ in us is greater than we know. All things are possible if you dare to believe." 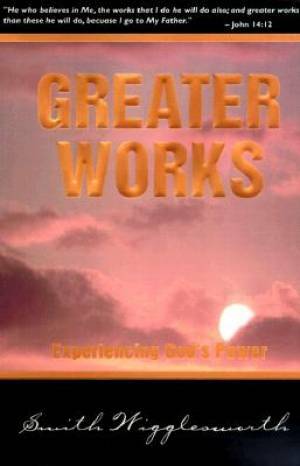 Greater Works by Smith Wigglesworth was published by Whitaker House in March 2000 and is our 17905th best seller. The ISBN for Greater Works is 9780883685846. Be the first to review Greater Works! Got a question? No problem! Just click here to ask us about Greater Works.